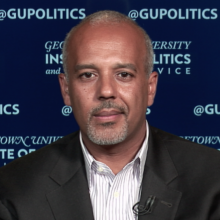 Mo Elleithee is the founding Executive Director of Georgetown University’s Institute of Politics and Public Service, the first institute of its kind in the nation’s capital. Before launching the institute in 2015, Mo spent two decades as one of the top communications strategists in the Democratic Party, most recently as Communications Director and chief spokesman of the Democratic National Committee. A veteran of four presidential campaigns, Mo was Senior Spokesman and Traveling Press Secretary on Hillary Clinton’s 2008 campaign. He served as a senior advisor and strategist for Senator Tim Kaine’s campaigns for Governor and U.S. Senate, and has worked on numerous other statewide and local races in every region of the country. Mo earned his undergraduate degree from Georgetown’s School of Foreign Service, and an M.A. in Political Management from The George Washington University. He lives in Washington with his wife and two children, and can often be found at the Verizon Center (or on Twitter during the off-season) cheering on his beloved Hoya basketball team.